This is the 21st century—the age of polymer pistols and digital apps, of cars with more computing power than NASA had available to it when Neil Armstrong walked on the moon. Such modern things were not available to me back when I fairly clanked stepping out of the gun shop doors each evening. We had some airweight snubbies available then, but mostly we had steel. And steel revolvers with short barrels are compact but a tad hefty. So in this modern era—when everything is lighter, plastic, digital and impervious to rust—is there still a place for the all-steel snubnose revolver? To test that, I borrowed the newest Ruger SP101. A gun that first saw the light of day in 1989, the Ruger SP101 has been available in expected and unexpected calibers. The former group consists of the .38 Special and .357 Magnum; the latter, .32 H&R Magnum and .327 Federal Magnum. The model I got in for testing is a distributor special, available from TALO (TaloInc.com), called the Ruger SP101 Novak. It is a five-shot, stainless, double-action .357 Magnum revolver, with, you guessed it, Novak sights—with a rear sight that’s scaled-down proportionally to fit the SP101 frame. Now, snubbies and I go back a long way, and one of their endearing aspects is that they are compact. That also poses a problem for me. I can’t palm a basketball, but I have big hands with slender fingers. (Yes, Mom wanted me to be a surgeon. Sorry, Mom.) And small grips make a handgun tough and sometimes painful to shoot. So a compact gun with bigger-than-compact grips was my usual approach, even if it made for a package a bit more difficult to carry concealed. In the case of the Ruger SP101 I had back then—and still have today—it’s the best of both worlds. The grips are large enough for me to get a good hold for a firing grip and yet still compact enough that I don’t risk being that “lumpy” concealed carry dude. Also, it’s comfortable, but we’ll get into that in due time. At 25.5 ounces the Ruger SP101 Novak is going to sag your pocket, but if you are carrying properly, there is no such thing as “pocket” carry. You need a proper pocket holster, belt holster (and proper belt) or shoulder rig of some kind. With a proper holster, the weight is not a big deal. Yes, it is more than a compact revolver half that weight would be, but I’ve fired revolvers that weigh half what this one does and they were no fun at all—no fun even before .357 Magnum enters the picture. And that’s why, even with its successful polymer-framed LCR in the line, Ruger continues to pay attention to its steel guns. The rear sight is a real rear sight—in this case a scaled-down Novak that won’t snag on the draw. It works like a champ. The genesis of this new Ruger SP101 comes from a special Wiley Clapp edition of the steel-framed GP100. “The idea was to take some of what we learned on that project and roll it into the SP101, creating sort of a higher-end SP,” Hindle said. The sights were developed by Wayne Novak and Charley Pulit at Novak’s shop in West Virginia. The rear, as I mentioned, is a scaled-down Novak sight designed specifically for the Ruger SP101. The rear is dovetailed into the topstrap of the Ruger SP101, and Hindle noted that cutting the topstrap had no effect on the strength of the frame. There’s so much there that the sight dovetail makes no difference. Ruger is proud of how tough its handguns are, and the last thing its designers would do is jeopardize that reputation. So don’t worry, be happy. The front is also a Novak and is also fit into a dovetail. It features a brass bead for good visibility even in low light. The front sight is also dovetailed into the barrel. It features a brass bead insert, and for those of us who don’t feel the need for tritium sights or the desire for a fiber-optic sight, the brass bead works very well indeed. The designers also worked on the shape of the crown, adopting a geometry similar to that found on the new GP100 Match Champion. The crown is very important for accuracy, and according to Hindle, Novak’s 11-degree crown improves the Ruger SP101’s accuracy because it squares the shoulder where the rifling meets the crown. At least for the time being, this crown geometry is found only on the Novak version and not on the rest of the SP101 line. The Ruger SP101 grips are an interesting part of the design, one the new model does not change from the original. For eons, standard grips on revolvers have been planks of wood, clamped to the frame by a single screw and held in place with a fixing pin. They can work loose, they can warp and create gaps, and because they are wood, they offer no real reduction of recoil. Ruger SP101 grips are different. First, the grip is actually a single hunk of molded rubber that slides up over the grip post of the frame. It can’t wiggle loose because it is not only a tight fit, but also secured with an aluminum cross post. SP101 grips feature panels that fit into the molded rubber grip, and on the Novak model, they’re stained wood—the same style found on the standard-production, adjustable-sight SP101 versions. One of the advancements on the SP101 Novak is a newly designed 11-degree crown for enhanced accuracy. Speaking of the mainspring, it is a coil spring on the Ruger SP101. You could dry-fire the SP101 until your trigger finger bulked up to the size of a banana and you would not weaken the spring. The design and composition of the grip act to dampen felt recoil. Since you’re holding a rubber-wrapped post, the frame can recoil inside the rubber, and so the recoil energy is therefore inefficiently transmitted to your hand. In other words, the rubber soaks up a lot of the energy. I found the Ruger SP101 Novak to be quite comfortable shooting .38 Specials, even those of the +P variety. A 25-ounce revolver fed .38 Specials is not going to kick very hard, no matter how small it is. The +P loads were noticeably sharper, but still no big deal if you’re accustomed to recoil. If you were introducing a new shooter to the SP101 Novak, I’d start them out with target wadcutters. The SP101’s hardwood panels are set into a rubber mono-grip that fits over the frame and is secured by a cross pin. The copper pin is for capturing the mainspring spring during disassembly. My practice runs with .357 Magnum ammunition were interesting. Thanks to the grip, I experienced a lot less recoil than I was prepared for. Don’t get me wrong; it wasn’t a picnic. If I really felt the need to be using full-house .357 Magnum ammunition in a carry gun, I’d resign myself to packing a bigger revolver. At the same time, I found it very interesting just how much performance the 2.25-inch barrel delivered. I was expecting nearby shrubbery to be scorched, dry grass set aflame and eye-searing balls of flame every time I touched off a magnum. Ammunition makers have learned a lot over the years, and these days you get magnum performance with much less drama—although Sir Isaac can’t be fooled, and you still pay the recoil price. The thought with snub-nosed revolvers is that they are not accurate, but I’ve always found Ruger’s wheelguns to shoot well. And so it was with the Ruger SP101 Novak, with one very odd exception. Our testing protocols at Handguns call for testing barrels this short at 15 yards instead of the customary 25. So you can understand my alarm when the “group” with one particular load started lapping over onto other targets. I have experienced this only rarely in the past, but it is something I have seen: a particular handgun really not liking a particular load. In this instance, the particular Ruger SP101 Novak I was testing didn’t like the Hornady 100-grain FTX load. No, amend that: it loathed the Hornady 100-grain FTX load. Where other loads were punching two-inch groups, this was scattering shots over five and six inches. The revolver exhibited good accuracy and thanks to its grip design proved soft-shooting—even with .357 loads. I tried the Hornady FTX load in another revolver, and that one (also a snubbie) punched them into a tight cluster. 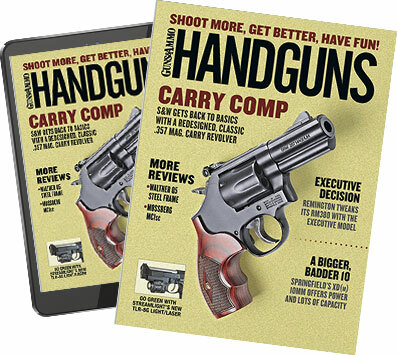 So always test your ammo in your handgun, because this one in 10,000 combo might strike—with any gun and any ammo. On the other end of the spectrum, please note how much the Ruger SP101 Novak loved the Hornady 90-grain FTX load. The accuracy (the one load aside) of the Ruger SP101 Novak is quite remarkable. This is due in part to the new crown geometry. So if it makes a noticeable difference, why hasn’t Ruger put it on all its revolvers? I asked Kurt, and he was quite clear. Because it’s new, it has to be tested. Ruger is nothing if not prudent about changes. Ruger plans to test the new crown geometry on all of its revolvers, and where it improves accuracy, Ruger will incorporate it. Back to our initial discussion of whether there’s still a place for an all-steel snubnose revolver. The plain fact is they are heavier than an airweight revolver, and they do not hold as much ammo as an equally compact 9mm pistol. Me, I don’t see much of a problem in either case. The extra weight is easy to pack, given a good holster. And the extra weight helps to dampen the vigor of +P .38s or .357 Magnum ammo for guns so chambered. The difference in ammunition capacity between the Ruger SP101 Novak and an equally small 9mm semiauto is not all that great. Five for the Ruger SP101 and an equal number, maybe an extra shot, from a compact 9mm. Yes, compact 9mms hold more than that—when you make them larger than the SP101, with a longer magazine. You don’t get something for nothing. We also have the superb accuracy the Ruger SP101 Novak demonstrated and the simplicity of operation of a double-action revolver. No external safety to mess with, no magazine button to bump. Just line up the sights and stroke through the trigger. And as Kurt said, it makes for an excellent home defense gun as well—due to its accuracy, simplicity and soft-shooting qualities.